Two months ago on a humid day, I accompanied Jee to a private oolong lesson led by Timothy Hsu, proprietor of The Mandarin's Tea Room. (Read Jee's review.) Do you know that humidity is good for tea? Timothy told us that humid air "opens up the tea leaves." I have struggled to write clearly about my experience that afternoon. I took notes about the teas we tasted but the lesson was more than that. It was the interaction between the three of us, the light in the room, the arresting photos on the walls, and the gorgeous table and tea ware. 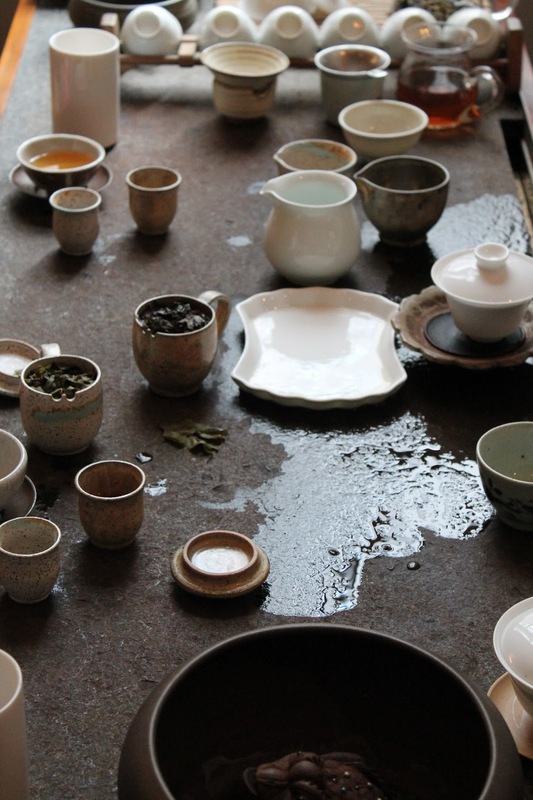 Perhaps it has been a challenge to write about the tasting because I got tea drunk! Instead of further postponement, I have decided to share several photographs of the tasting. Enjoy! Have you had a hard-to-describe tea experience? P.S. Have you read the recent press coverage of tea rooms in NYC? Your experience sounds wonderful. I've been meaning to get there for a while now but it just never seems to work out. Hi there Nicole, I enjoyed myself and highly recommend it. Thanks for commenting.